Fort Amol is a Stormcloak fort located to the northwest of Darkwater Crossing along the White River. It is initially occupied by hostile elemental mages. The fort has a courtyard and two interior zones: Fort Amol and Fort Amol Prison. As you travel down the White River, a small stone cairn will mark the path to Fort Amol. Its walls are easily visible from the river banks. Four hostile elemental mages are located outside and inside the courtyard. If you come from the road, one will attack you before you even make it into the fort. Two others may join the fray from inside the courtyard. A final mage can be located on top of the barracks performing some type of ritual. Corpses of slain Stormcloaks can be found throughout the fort exterior, as well as an alchemy lab. There is a chest next to the alchemy lab and a shrine of Julianos. Another chest can be found in the eastern tower. Sometimes, when you clear out the mages, Fort Amol will not be listed as "Cleared". However, after a couple of days, Stormcloaks will retake the fort. If you follow the Imperial Civil War questline, a battle will be fought here, after which the garrison will change to Imperial. 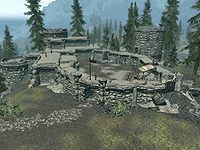 If you are not aligned with the faction controlling the fort, they will consider you to be trespassing if you enter either of the two interior zones, excluding the courtyard. However, if you are allied with the faction controlling the fort, you can get rest, food and a borrowable horse in this fort. As you enter from the ground level in the courtyard a mage will be standing in the next room. Any sound of battle with him will likely cause the other two mages from upstairs to join the fray. This can make for a very warm welcome. Be very wary of the fire mages as they can do large amounts of damage very quickly, especially if carrying items such as a staff of firebolts. The downstairs entrance room contains a cooking pot and some minor loot on the table. The room to the northwest hosts an arcane enchanter, a large number of potions and alchemical ingredients. A copy of the Enchanting skill book Catalogue of Armor Enchantments is lying on the cupboard along with an apothecary's satchel. A locked chest can be found in the northwest corner on a wooden promontory. The upstairs room contains some iron armor and weapons lying around, some coins and diverse ingredients. There is a second chest here which can be looted. The central guard chamber contains two mages that will attack as soon as they spot you. They are much tougher than the weaker ones in the courtyard. There are a few leveled soul gems on a bookshelf. Minor loot can also be found on the central table in the main chamber. To the far left of the room, to the right of the two bookshelves, pick up or move the lantern inside the bucket to discover a Spell Tome: Bound Bow underneath. Other than that, the prison holds nothing of interest, not even some lockpicking practice since all the prison cells are already unlocked. The fort will be occupied by Imperial soldiers, as well as a Fort Commander who oversees the fort's operations. A forge, an anvil, a workbench and a grindstone will replace the shrine of Julianos. Fort Amol also appears in Arena and ESO. When the Imperials occupy the fort, the alchemy bench will become embedded in a workbench. Similarly, there will be one chest embedded within another right next to it. The Stormcloak corpses and the ritual circle atop one of the towers will remain once the hostile mages are expelled. Sometimes when you clear out the fort of the hostile mages, the Stormcloaks will not regarrison the fort. Instead, everything will respawn, including the mages, containers, and the dead Stormcloaks outside (marked as corpse) with all of their loot intact. There was supposed to be an Amulet of Julianos near the shrine, however it is incorrectly embedded within the shrine itself and not directly accessible. Explosive effects can dislodge it and make it accessible again. This page was last modified on 24 March 2017, at 05:30.